Discover how hormones can play a big role in fat loss, sleep and exercise. Learn easy tips to help balance your hormones by improving your food intake and manage weight gain. 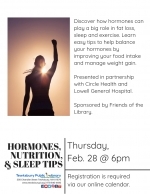 Presented in partnership with Circle Health and Lowell General Hospital. Sponsored by Friends of the Library.